Macaroni Grill's Pasta Milano dish consists of "roasted chicken, sun-dried tomatoes, fresh mushrooms and imported farfalle pasta in a roasted garlic cream sauce." It sounds pretty approachable if you wanted to make it at home, right? Well, fortunately I found a recipe online to use as a guide. Rather than using fresh minced garlic, I wanted a subtle sweetness and used roasted garlic instead. I also decreased the amount of chicken from the original recipe since I wanted to cut it up and toss it with the pasta rather than serve a whole breast per person. Another change to the original recipe I used was making the sauce in one pan versus two. Who wants to clean more cookware than needed anyway? Besides, using the same skillet allowed me to use every bit of flavor. Lastly, I baked the pasta dish in the oven with a generous topping of Parmesan cheese for some texture on the top and to help the pasta soak up all the flavors of the roasted garlic cream sauce. I'm definitely making this again and again because it was the hit of the Pasta Party dinner! In a large skillet over high heat, brown the diced bacon. Season the cut up chicken with salt and pepper. Add the chicken to the skillet and saute until lightly browned. Once the chicken is cooked, add the sliced mushrooms and saute until browned. Remove from pan and set aside. Add the roasted garlic, sundried tomatoes and chicken broth to the hot skillet. Allow it come to a boil. Reduce heat and simmer, uncovered, for about 10 minutes or until the tomatoes are tender. Add the cream and bring to a boil; stirring.Take off heat and add the bacon, chicken and mushroom to the sauce and set aside. Meanwhile, preheat your oven to 350 degrees and bring a large pot of lightly salted water to a boil. Add dry pasta and cook for 8 to 10 minutes or until al dente; drain, transfer to a bowl. Pour the chicken and sauce over the hot pasta and toss. Place in a baking dish and top with shredded Parmesan cheese and bake in preheated oven for 5-7 minutes until cheese melts. * To make ahead/freezer meals - Prepare as directed, however cook pasta to barely al dente. There should be a bite to the pasta where it's not completely cooked. 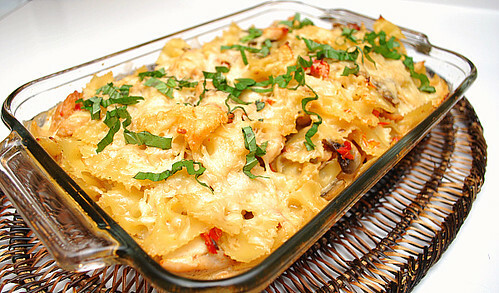 Place pasta, chicken and sauce in an ovenproof container and allow to cool. Cover and freezer. When ready to prepare, defrost and bake in preheated oven as directed above. How do you roast garlic? Also, why did you cut back on the amount of chicken, as per original recipe. @Jackie - please see the recipe as I've updated it with a link on how to roast garlic and why I decreased the amount of chicken used. I love creamy pasta dishes over red sauce dishes, so this one jumps out at me. I can't wait to try my hand at it! Congratulations on your little man - hope you're all settling in well! thanks for sharing the recipe. nice post. Made it with Half & Half and it came out looking like soup. I had to add flour to get to thicken up. Hi Ashe's - Sorry it didn't work as well for you. The 8oz of pasta when cooked comes out to 3 cups of pasta and when it sits aside with the 1 cup of cream or half & half, the pasta would absorb some of that liquid before it bakes. I'm not sure how it came out looking like soup since it would take much more cream/half & half for the amount of pasta called for in the recipe to have that consistency. I hope with flour, it came out fine! Love this recipe! I'm using it in my freezer meal group this month. One question...do you drain the grease from the bacon or leave it? I'm multiplying this times 15(I know, crazy) and that much bacon grease seems like a lot. Thanks for posting! This was delicious! I'm new to your site and am excited to try more. The dish was little time consuming, but definitely worth the wait. We made it with mushrooms as shown, but were dreaming of other veggies to try next time -- asparagus, broccoli, artichoke hearts... Can't go wrong when they're covered with a sauce like that! Thank you! I also tried this with half and half and it was extremely watery. I added some cheese to try to thicken it up which kind of worked but most of it was all in the bottom of the casserole dish and ended up making the pasta on the bottom kind of mushy after baking. However, it's a really delicious sauce and it tastes amazing. I would just recommend using only heavy cream, or creating a bit of a roux before adding the half and half to make it thicker. You say 1 cup of chicken broth divided. When do you use the two halves? I made this last night for my family. I am testing recipes ahead of time for our trip this summer. I accidentally made the recipe with the whole box of pasta (16 oz.) instead of the 8 oz. called for. Even though my husband is not a big pasta fan and I mixed in twice the amount of pasta than the recipe called for, all in my family LOVED it. It is very flavorful and is now one of my go-to recipes when I have chicken. I'm looking forward to trying more of your recipes. This was delicious. I made this tonight for dinner and two more to freeze. This will be a great meal on a busy night! Thanks so much for posting!